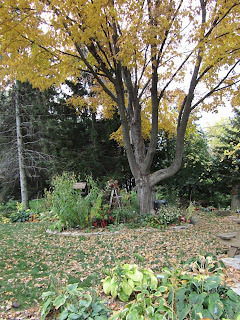 The leaves really started to fall last week. I woke up Saturday morning to see my neighbor boy, who is 8, raking all of the leaves out of my yard into his. I wasn't about to stop him that's for sure. The next morning he was at it again. My husband and I went to breakfast, and when we came back he was still raking all of the leaves into his yard. He spotted me getting out of the car and yelled to his younger sister, "Quick hide, we're stealing their leaves!" The neighbor's yard with our leaves. oh yeah, I have been the victim of the leaf pile with the dog pile at the bottom.